This smoothie is sweet, delicious, and provides an entire alphabet of vitamins and minerals! 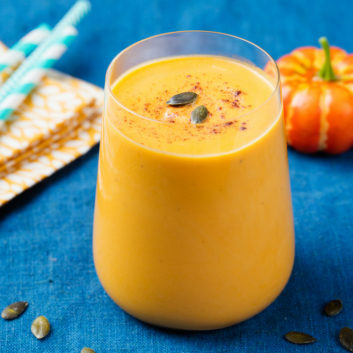 You get calcium from the yogurt and skim milk, beta carotene from the pumpkin, plus a dose of potassium and magnesium. This power breakfast will fuel you up! Place all of the ingredients in a blender and purée until smooth and frothy.